This section describes how to update and modify a VLAN interface. Name. System name for the VLAN interface. Not editable. MAC. MAC address that is assigned to a certain VLAN. Not editable. IP Address. IP address assigned to a given interface. Support IPv4 and IPv6. Netmask. Network mask in IPv4 format currently assigned to the NIC that can be edited. For IPv6 use CIDR format (0 to 128). Gateway. Default gateway IPv4 or IPv6 used by the VLAN. 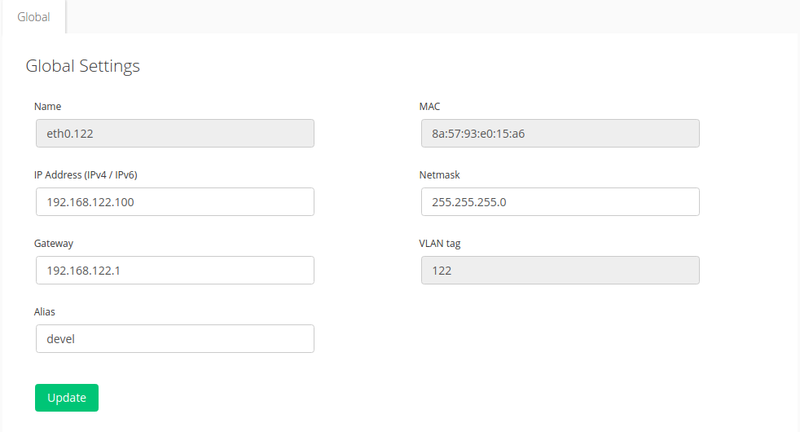 VLAN tag. Tag number to be used by the VLAN. Not editable. IPv4 and IPv6 stacks are supported, take into account that the Netmask and Gateway must be configured in the same stack than the IP. To apply the changes click on the Update button. When the configuration is updated the VLAN interface is brought up.